There are a number of international airports taking the pre-flight experience to the next level though – offering exhibitions, movies or even a pre-flight surfing lesson. So with a little help from travel comparison site dealchecker I’ve rounded up the best airports around the world to have fun before you fly. The multi award-winning Singapore Changi Airport is not just a place for passengers to transit but is a shopping and dining destination for domestic travellers too. For anyone experiencing a layover here, as I do often, there are a vast number of ways to keep yourself busy. 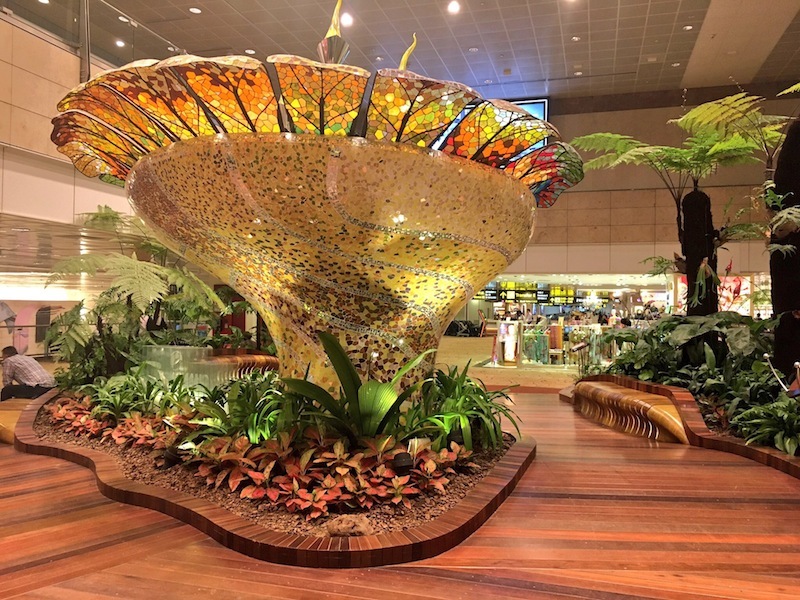 My favourite experiences include a visit to the Butterfly Garden, an unexpected airport paradise where you’ll find 1000 butterflies, tropical plants and a 6-metre grotto waterfall. You can also catch a movie at the 24-hour free cinema, go for a dip at the Balinese-themed rooftop swimming pool or even take a ride on the world’s tallest airport slide found at Terminal 3. They certainly know how to have fun before flying in South Korea. The incredible Seoul Incheon Airport, which opened in 2001 and has been named the world’s best airport by Airports Council International every year since 2005, features an ice-skating rink, 2 cinemas, a casino, Museum Of Korean Culture and even a 330-yard golf course. I don’t think I’d mind getting delayed here! Germany may not be known for its surfing but that hasn’t stopped Munich Airport making a splash with an artificial wave pool where travellers can test out their surfing skills. 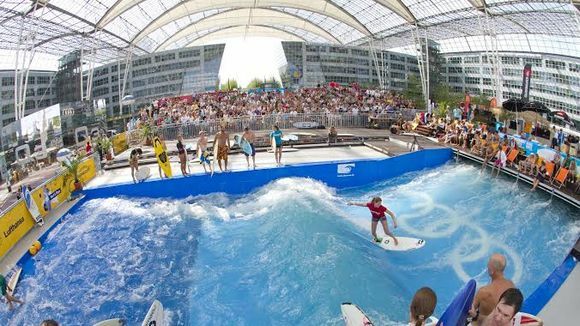 For 5 years in a row Munich Airport Centre constructed a temporary wave pool and invited surfers of all skill levels to ride the world’s biggest standing wave. What a great way to keep the children amused! Japan’s Tokyo Airport also has an unexpected claim to fame – it has its own planetarium. At the Starry Café and Planetarium you can dine under the stars as an eye-popping 40,000,000 astronomical attractions are projected onto the ceiling. Plus, if you’re worried about leaving your pets behind when you fly you can check them into a 5-star Pet Hotel at Tokyo Airport. Up to 250 dogs, cats, rabbits and ferrets can enjoy the on-site veterinary, grooming services, exercise field and attention from staff 24 hours a day. Finally, I love the social media boastability of being able to say you grabbed a coffee at one of the most luxurious cafes in the world. Qatar’s Hamad Airport boasts a dazzling gold-plated coffee kiosk that is guaranteed to make you feel rich and famous, at least until you finish your drink and board your economy seat that is. Find out more about the best airports around the world to have fun before you fly. This post was written in collaboration with travel comparison site dealchecker. Wow, that Munich airport!! I used to love living in Seoul, as that airport is the absolute best hub ever! I had no idea it was so awesome! Have been wanting to visit Seoul for a while so this makes me even more intrigued to go. Me neither! It seems so random but so much fun at the same time! Is it weird that I get excited just to visit Heathrow? Definitely my fave airport.